How to convert DVD to apple TV with best Mac DVD to apple TV converter? DVD movies have been an important part in our life. We watch DVD movies to relax ourselves. AHABX7FQCDT However, we cannot watch DVD movies directly on TV. 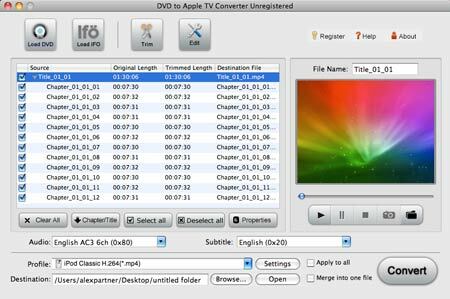 DVD to apple TV converter for Mac comes to solve this trouble for you. 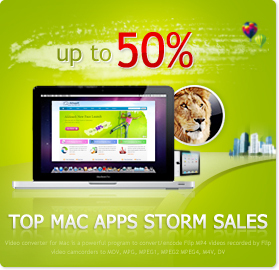 As best Mac software , DVD to apple TV converter for Mac has become very famous among DVD fans. 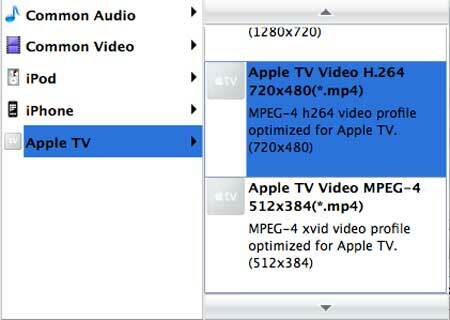 It helps users convert, edit, and import DVD movies to apple TV on Mac. Then how to convert your favorite DVD movies to apple TV? It's a piece of case. Just follow me step by step. Before we start, please download DVD to apple TV on Mac and install it on your computer. It is very easy to use and has user- friendly interface. Step 1. Load DVD files. Insert DVD to your computer, click Load DVD icon or Load IFO icon to add DVD files. You can preview the whole DVD movies in the preview window, and take some snapshots if you like. If you do not need to convert the whole DVD movie, you can click Chapter/Title, and choose which part you like. Of course this is optional. Step 2, click Trim and Edit icon, you can edit the movie. Trim the length of DVD video to a certain length you like; Crop unwanted frames of the video clip like black edges; Change Brightness, Contrast, Saturation of the DVD video and to flip it vertically and horizontally, Apply special effects like Gray, Old film and Emboss. Step 3, choose Audio and Subtitle for your favorite TV, and choose right format. And then click the triangle before Settings, you can choose right format for the outputting movie, so that you're apple TV will play the movie well. Click Settings, you can set Resolution, Encoder, Frame Rate and Bitrate. To set audio output settings: Sample Rate, Channel, Encoder and Bitrate. Step 4. convert and output the movie. Click Browse icon to choose a right output road for your output movies files. And then click the round icon Convert, which is in the bottom right, at last. You will get the output video in a while. Now you can watch wonderful DVD movies on the TV and share it with your family or your friends. Come on, just download best Mac DVD to Apple TV converter and convert DVD movies to apple TV now.